In this tutorial, you will focus on ANSI(American National Standards Institute) SQL that works on every database like Oracle, MySQL, Microsoft SQL Server, etc.! Let's start with an introduction to the SQL (Structured Query Language) and why a data scientist may need it. SQL has become a requirement for most data science jobs that include: data analyst, BI (Business Intelligence) developer, programmer, database programmer. SQL will let you communicate with the database and work with your data. If you have used software like Tableau or any other data reporting or visualization software you might have seen how you connect your project to a database and, drag and drop graphs and plots onto the report specifying the fields only, and the software does the rest for you. So when you perform drag and drop activity of data attributes or use the graphical user interface to do all the operations within in a click, at the back of the software is running SQL that is interacting with the database. By learning SQL, you can directly interact with the database. SQL can be used with all application programming languages like PHP, Java. You can create your own data visualizations by integrating SQL in the application or get data from the database and convert into XML, JSON formats to use them in web services or APIs. Databases have evolved over the years, as Big Data has become the talk of the town and data used in our daily lives, NoSQL databases are becoming popular. Learning SQL will help you build a strong foundation in databases and help to understand when to use structured databases and when to use NoSQL databases and appreciate their differences. Here I will go through a little bit of introduction and terminologies used in SQL and databases that will help you learn to code faster! If you already know about what a relational database is and what is SQL, then you can skip to code. A database is an organized collection of information. To manage databases, we need Data Base Management Systems (DBMS). A DBMS is a program that stores, retrieves, and modifies data in the databases on request. There have been different types of databases over the time: Hierarchical, network, relational Databases and now NoSQL databases. Relational Database is a collection of relations or two-dimensional tables. Table A Table is the basic storage structure of an RDBMS. A table stores all the data necessary about something in the real world. Example: Employees. Single Row or Tuple Representing all data required for a particular employee. Each row in a table may be identified by a Primary Key, which allows no duplicate rows. Foreign Key A Foreign Key is a column that identifies how tables relate to each other. A foreign key refers to a Primary Key in another table. Create, Alter, Drop, Rename, Truncate. If you have credentials to login to a database, you can view the database objects by using queries or GUI to view the database objects as per your database vendor. 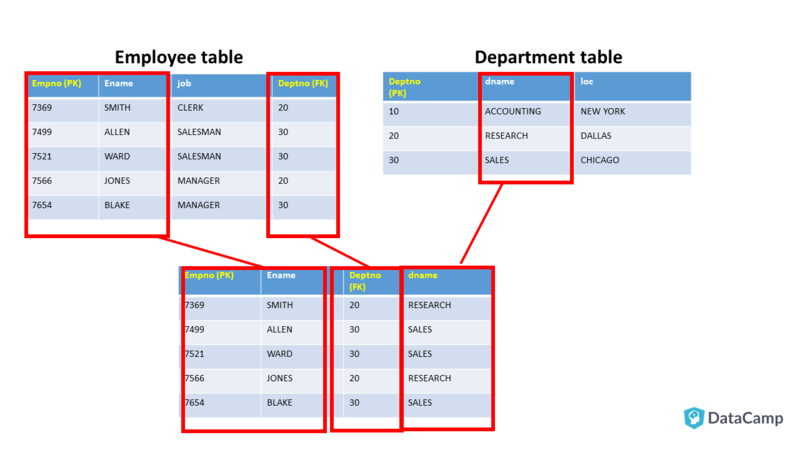 Each column in a database has a name and its data type and sometimes a size associated to it. It is the job of the database developer to design the database and decide what data type should be used according to requirements and volume of data. As a data scientist, you need to be familiar with the data types as it will assist you to use database functions properly and write your queries accurately. There is a data type for each type of column in a database such as a person's name, some text stored, numbers, an image stored in the database and so on. Consider a database with two tables named emp that holds employee data and dept table that holds records about departments. The emp table has employee number (empno), employee name (ename), salary (sal), commission (comm), job name (job), manager id (mgr), hire date (hiredate) and, department number (deptno). As Manager is also an employee and will have an employee number, mgr is from one of the empno whose job is "MANAGER". The dept table has department no (deptno), department name (dname) and location of the department (loc). Note that, different databases have different date format. The one here, DD-MON-YY is default date format for an Oracle database. The default format for Microsoft SQL Server and MySQL is YYYY-MM-DD. Your database tables may be different, so you have to adjust only according to your table name and attributes' name. In this tutorial, you will be only reading from the database and not writing to, updating or creating new tables and objects. So no worries on any data loss or changes! In the above database schema, you can see that the emp table has six attributes for the entity Employee. Table dept has three attributes for the entity Department. 1. Projection: You can use the projection capability in SQL to choose the columns in a table that you want to be returned by your query. You can choose as few or as many columns in the table as you require. 2. Selection: You can use the selection capability in SQL to choose the rows in a table that you want to be returned by a query. You can use various criteria to restrict the rows that you see. 3. Joining: You can use the join capability in SQL to bring together data that is stored in different tables by creating a link between them. The basic SELECT statement allows you to specify what columns do you want from which table. The SELECT clause specifies columns, expressions and FROM clause specifies from which table to get data from. NULL values are treated differently in databases. A NULL value implies that a value is unknown. Any operation performed with NULL results in NULL. Different databases have different functions to handle null. There is a common function that is used in MySQL, Microsoft SQL Server, and Oracle to treat NULLs. You can see in above outputs, that the column name is the same as the database field or the expression you select. Sometimes, while generating reports you want to give your own names to headers. This can be done using aliases. SELECT ename AS "Emp Name", sal*(20/100) as "20% of Salary"
When you are giving an alias that has spaces in it you have to use double quotes. Otherwise, there is no need to put double quotes after AS. Sometimes you can also omit the keyword AS. Oracle supports CONCAT() and || but CONCAT() will take only two arguments. You have to use nested CONCAT(). Microsodt SQL server uses '+' operator and CONCAT(). Here the deptno 20 and 30 are repeating. You can eliminate such rows by using the DISTINCT keyword in the SELECT clause. The WHERE clause is used to filter data on some condition. Use of =,<>,!=,>=,<=,>,< is simple as shown in the above query that is using =. Here NOT executed first and after NOT, AND was evaluated. LIKE uses two wildcards: percentage % and underscore _ to represent the number of characters in the pattern. _ specifies the number of unknown characters before or after the known character. One underscore is one character. _r%: Match value having r in the second position. The SELECT statement in IN() is also called as a sub-query. More on sub-queries later in this tutorial! Notice the use of subqueries in the above examples. You will learn more about sub-queries later. Note: Default order is ascending denoted by ASC, and you don't need to specify ASC. Different databases have different function names for the same functionality. Here I will tell you common useful functions among Microsoft SQL Server, Oracle, and MySQL. Some of these you have already learned in the above sections. At the end of this section, you will find links to a complete list of functions from these vendors for further practice. LOWER(): Converts string to lower caps. UPPER(): Converts string to lower caps. SUBSTRING()[SQL Server]: Returns substring as specified SUBSTRING(string, start-position,length). Just replace function name to SUBSTRING for SQL server. Just replace function name to LEN for SQL server. ROUND(m,n): Rounds the value m to specified n decimal places. FLOOR(n): FLOOR returns the largest integer equal to or less than n.
Date and time functions allow you to manipulate the date by adding days, calculating months between two dates, etc. Such functions are beneficial when generating reports. Date functions also vary from database to database. A function may perform same functionality but may have a different name in another database. 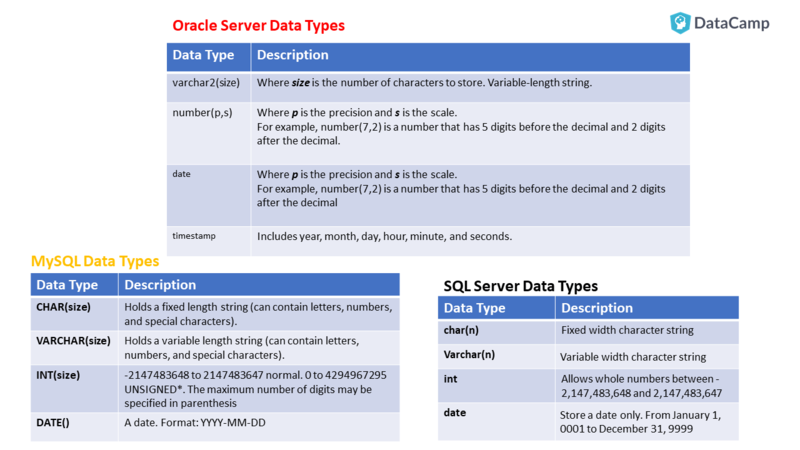 Here you will look at a few examples and then I will provide you with links to the date functions of the top most common databases: Oracle, SQL Server, and MySQL. Go ahead and try out these examples on your database server! Grouping functions or Multi-Row functions are applied on groups and return one result per group. You will need group functions when you want to find out facts such as total sales per quarter, the Average price of a product throughout some time period, highest investment your company received this month and so on. HAVING clause will come after GROUP BY and will apply conditions on group functions. COUNT is a group function that counts the number of rows of data according to condition or no condition. The COUNT function ignores null values. SELECT sum(sal) as "TOTAL SAL", avg(sal) as "AVG SAL", min(sal) as "MIN SAL", max(sal) as "MAX SAL"
You can group results by more than one column. You can restrict group results using the HAVING clause. It's used only for group conditions. Note: Do not use WHERE for applying conditions on group functions. To generate a report like above, you need to link employee and department table and get data from both of them. For this Joins are used in SQL. The Cartesian product is formed when every tuple of a relation R creates a combination with every tuple in a relation S.
Cartesian product operation also called as Cross Join multiplies two tables to form a relation that consists of all possible pairs of tuples from two tables. If one relation say, R has I tuples with M number of attributes and other relation say S has J tuples N attributes cartesian product will have IxJ tuples with M+N attributes. A cartesian product can be formed using the SQL complaint CROSS JOIN as well. 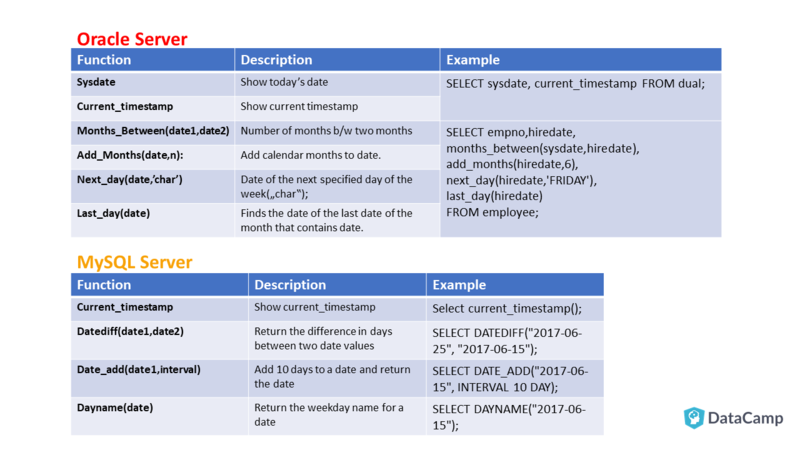 When data from two or more tables is required, a join condition is made using the common attributes linking the involved tables. These are most commonly the Primary Key and the Foreign Key. Cartesian products are used for simulation of large amounts of data for testing purposes. In the above query, deptno is the primary key in the department table and foreign key in the employee table. 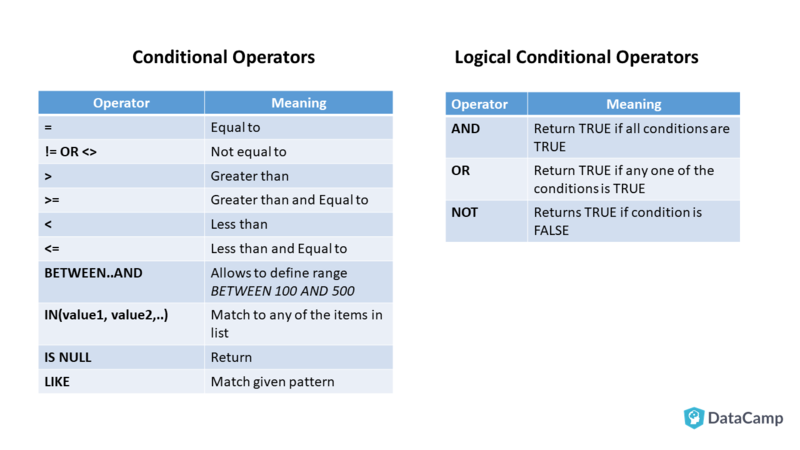 You can add additional conditions using logical operations as discussed in the sections above. If the same column name appears in more than one table, the column name must be prefixed with the table name. It is good practice to do this otherwise as well to enhance clarity. To join n tables together, you need a minimum of n-1 join conditions. For example, to join four tables, a minimum of three joins is required. 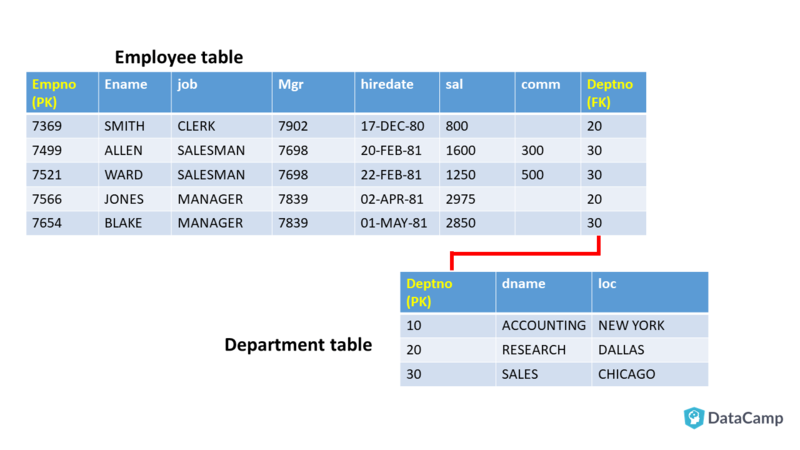 Table aliases: Table aliases are used such as in FROM employee e, department d where e and d are table aliases, to make it easier for the database engine to identify from which table the column is from especially when same columns are present in more than one involved table because otherwise error for ambiguous column will be given. And it saves time from writing large table names again and again. In above example, three tables are involved and two join condition one of them is a nonequi-join. Natural joins allow databases to join tables automatically by matching columns with the same name. If columns match with the same name but data types are different, then an error is given. 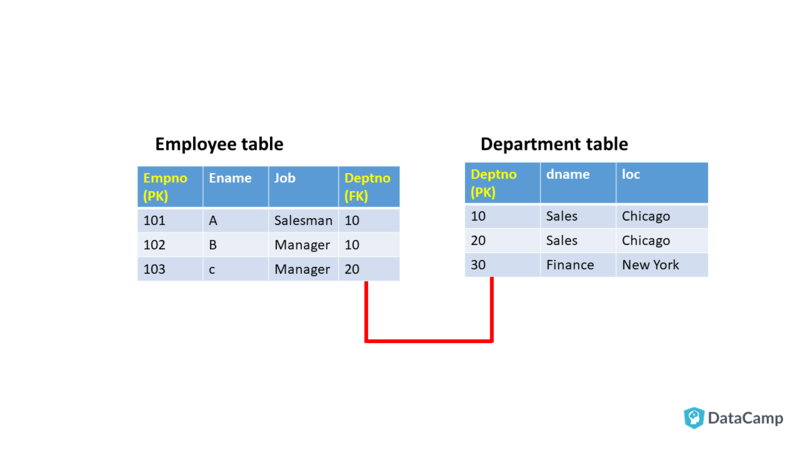 Syntax: SELECT FROM table1 NATURAL JOIN table2; SELECT FROM employee NATURAL JOIN department; Since natural join itself find out matching column it may find more than one matching columns with the same name but may have a different data type which may result in an error. So USING clause is used to specify columns on which to make an equi join. Note: NATURAL JOIN and USING are two different clauses and used separately. One cannot be used in the presence of the other that is mutually exclusive. 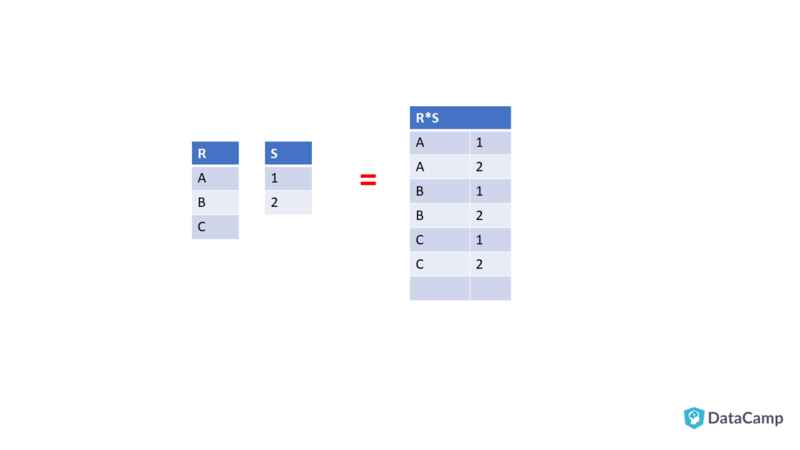 Right Outer Join: A join between two tables that returns the results of the inner join, as well as unmatched rows of the right table, is called RIGHT OUTER JOIN. Full Outer Join: A join between two tables that returns the results of the inner join, as well as unmatched rows of the right table, is called RIGHT OUTER JOIN. The department table had one unmatched row for deptno 10, and no unmatched row was found for employee table. 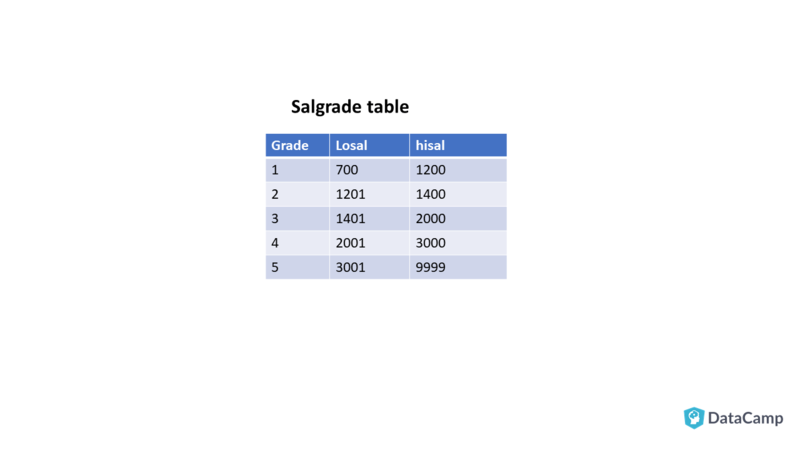 Similarly, salgrade has one unmatched row for grade 5. This can be solved using a subquery. The subquery (inner query) will execute once before the main (outer) query. Single-row subquery: Query that returns only one row from an inner SELECT statement. Multiple-row subquery: Query that returns more than one row from an inner SELECT statement. Place subqueries on the right of the comparison operator. Use single row operators (>, < , >= , <= , < >) with single row subqueries. Use multiple row operators (IN, ANY, ALL) with multiple row subqueries. Find employees whose salary is equal to any of the salaries of employees having a job as Manager. This will be a multiple-row subquery as the subquery can return more than one rows. In SQL Set operators are used to combine the results of multiple queries into a single result. It uses the set theory in mathematics and its operations such as UNION, MINUS, INTERSECT. Here you will see how you can use SET operators to optimize your queries. In this tutorial following SET operators will be discussed. Information: Queries using SET operators are called compound statements. Consider two relations (tables) R and S then UNION selects all rows from R and all rows from S eliminating duplicates. The number of returned rows can be maximum r+s where r is the number of rows in R and s is the number of rows in S.
The number of columns and the data types of the columns being selected must be identical in all the SELECT statements used in the query. The output is sorted in ascending order of the first column of the SELECT clause. NULL values are not ignored during duplicate checking. Intersection follows the same rule as in set theory, to give the common values from two sets. Consider two relations R and S then INTERSECT will return set of all tuples that are common in both R and S.
Say, you need to find a product that has a quantity between 1 to 100 but does not have quantity 50-75. Here you will use EXCEPT if you are using SQL server and MINUS if you are using Oracle server. All of the columns in the WHERE clause must be in the SELECT clause for the MINUS operator to work. This is the end of the tutorial. 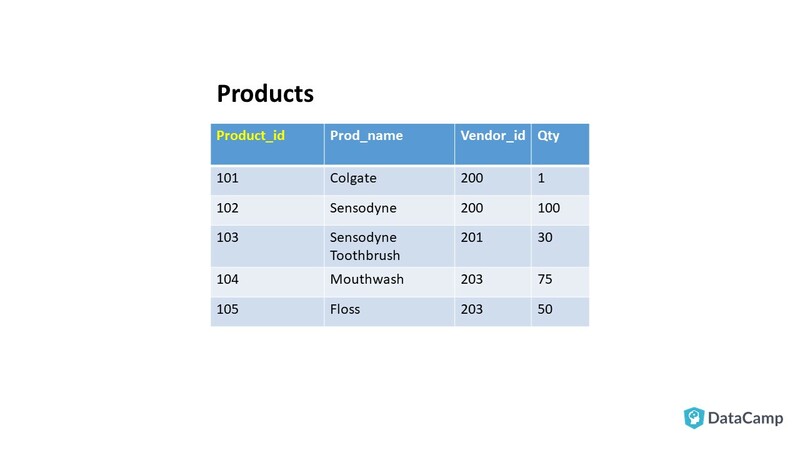 In this tutorial, you have learned a significant amount of SQL that will help you master SQL in your data science journey. SQL is used to generate reports from databases. You have learned in this tutorial the foundations of databases and SQL, common data types used, functions that help you to achieve formatting reports, aggregation of results creating summaries and also ways on how you can gather data from different tables in the databases according to your requirements! 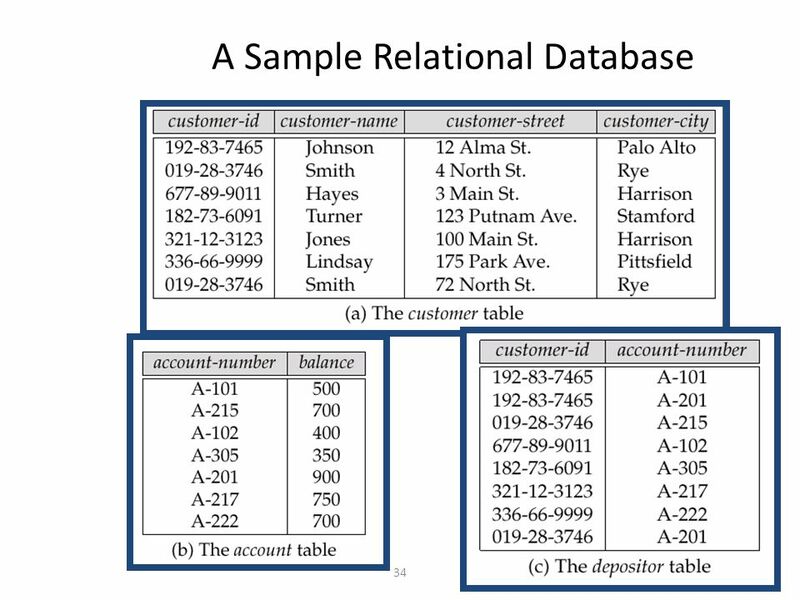 This tutorial is specifically designed for data science learners that will not only help them with relational databases but also go smoothly through NoSQL databases and how to use SQL skills in Big Data studies. If you would like to learn more about SQL, take DataCamp's free Intro to SQL for Data Science course.